SOCHI, Russia (AP) Spain needs to get its defense together if it wants to stay in contention at the World Cup. Players and coach Fernando Hierro know La Roja won’t go much further if it keeps repeating the defensive mistakes it made in the group stage. One of the pre-tournament favorites, Spain hasn’t impressed so far and just made it through to the round of 16 after a 2-2 draw against Morocco on Monday in Kaliningrad. Solid defense had been one of the team’s hallmarks, but it has conceded five goals in its first three matches in Russia. 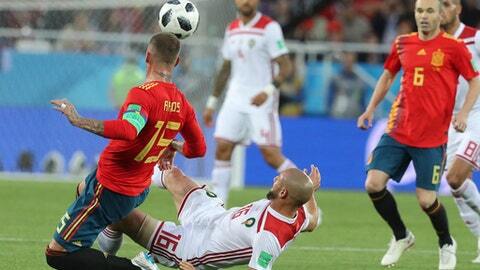 The first goal conceded by Spain on Monday came after a mix-up between captain Sergio Ramos and veteran Andres Iniesta while they exchanged passes near midfield. Neither committed to the ball, and Morocco forward Khalid Boutaib ran with it to score the opener. The second goal was a header by Youssef En-Nesyri, who was not well-marked after a cross into the Spanish area. Spain’s equalizer came with substitute Iago Aspas in stoppage time on a play that had to be confirmed by video review after the linesman raised the flag for offside. La Roja had already been benefited from FIFA’s video assistant referee in its previous game, when Iran’s potential equalizer didn’t count after a review. Spain ended up winning 1-0. Its first match was a 3-3 draw against Portugal in which Cristiano Ronaldo had a hat trick. Spain still won Group B thanks to Portugal’s 1-1 draw against Iran in a match that also was influenced by VAR. Spain and Portugal finished with five points each, but La Roja had the tiebreaker advantage because it scored more goals, six to five. Spain, trying to rebound from early eliminations at the 2014 World Cup and the 2016 European Championship, will face host Russia in the round of 16.